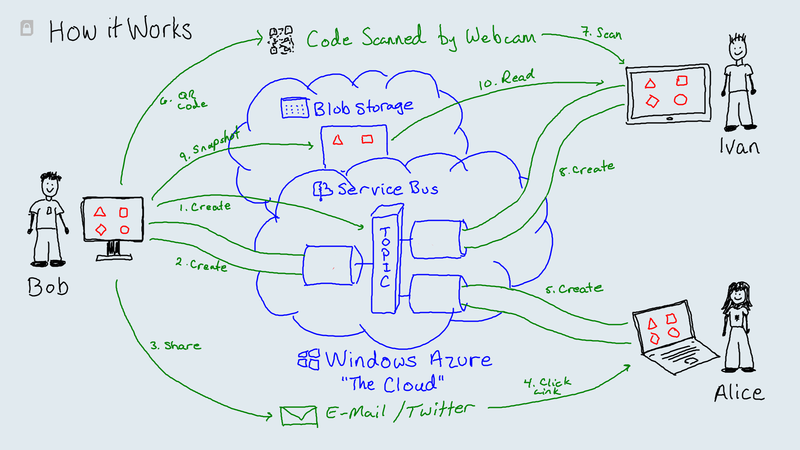 Last year I published Shared Whiteboard in the Windows 8 Store. This was an app that I never intended to write. When I say I didn’t mean to write it, I mean that I had no interest in Windows 8 or the new Windows app store. However, through early use of Windows 8 I became and advocate for the touch screen model of computing. It’s not a replacement for the mouse and keyboard, but works extremely well for some scenarios. Windows 8 also came with the largest API and programming changes since WPF. There was going to be a big learning curve. So, as I typically do, I ported an old game of mine to Windows 8 and published it to the store. After porting the game, ‘Roid Rage, I thought I new the new Windows system pretty well. That coupled with an initiative at work to get MSCD certified consultants, I sat the exam for “Windows Store Apps” without any further prep. During the exam, I thought I was going to fail as it was covering heaps of material that I wasn’t familiar with. At the end I passed with the lowest possible score and I was so surprised, I actually laughed out loud. So much so, that the proctor came in to see if there was a problem. Ok, that was a good wake-up call. I needed to learn the nooks and crannies of the Windows 8 API that I didn’t exercise while porting my game. I tracked down a list of features covered in the next exam and read up on all of them. I only really learn by doing, so I needed a project that would exercise all of these APIs. This included a long list of capabilities include touch, inking, character recognition, camera, networking, share contracts, standard menus, etc. So, Shared Whiteboard was the smallest product that I could imagine that had all the features I needed to learn. Finally, not related to Windows 8, I needed to have a back end server to relay messages between whiteboard clients. For this, I found the newly release Windows Azure Service Bus would fit the bill nicely. I managed to create an entire relay server without actually writing the server! I was pretty happy with the outcome and was pleased to be the LifeHacker and Microsoft Developer Round 4 winner. I hope you enjoy it too. Download Shared Whiteboard from the Windows Store. On its initial release, it apparantly filled a gap in the store. It started out with about 1000 downloads per month and a top 10 listing in the social category, not far behind facebook. All up, not a bad start for truly academic project.